Epic limo uses only the best of vehicles for your entertainment. Paso Robles limousine company Epic Limousine Services is now providing tours to breweries on the Central Coast, adding beer tasting tours to the agenda. Along with the most popular service provided, wine tasting, beer tasting is fast becoming a popular request, and Epic limo is meeting the needs of beer tasting patrons. These services are provided seven-days a week. 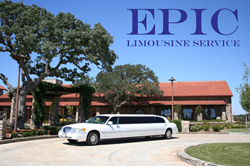 Epic Limousine Services company is owned, operated, and located out of Paso Robles. It serves all of San Luis Obispo County in the capacity of customer entertainment excursions, freeing customers of worrying having to drive while drinking, so wine tasting and beer tasting becomes an outing that can be enjoyed without the fear of driving under the influence. Epic Limousine Services covers the extensive 1,310 miles of SLO county city maintained roads, providing exceptional transit services safely with much concentration on the Paso Robles wine region. Epic limo services provides visitors and locals the opportunity to enjoy wine and beer tasting safely. Wine tasting and beer tasting are not the only services offered by the company. Epic Limousine Services uses only the best of vehicles for entertainment. Interiors are plush and comfortable. Exteriors are clean and glistening. Limos are stocked with glasses, alcoholic beverages, food, water, and sodas. Modern super-stretch limousines are driven on tours and accommodate 8 -10 passengers. Each limo boasts two 7” tv screens capable of playing MP3, CDs, and DVDs for customer enjoyment while traveling. Epic Limousine Services of Paso Robles employs qualified chauffeurs knowledgeable of the Paso Robles region and skilled in customer service. Importance of chauffeur appearance and cleanliness is of high regard. Chauffeurs aid in structuring a wine or beer tasting plan according to the customer's preference, or another option is the customer may use an itinerary or map already designed by Epic Limousine Services that can take a party of people to predetermined wine and beer establishments. "Epic limo caters to the Paso Robles region. The Central Coast features over 250 wineries that offer superb quality wine tastings, but let’s not forget to mention the great breweries the Central Coast has to offer as well. There are a lot of microbreweries popping up and beer tasting is becoming very popular," said Isaiah Streamland, owner of Epic Limo. Epic limo offers a discounted rate of $80.00 per hour to guests of Paso Robles bed & breakfast inns or hotels in the area, and caters to clientele of Paso Robles and all of SLO county in need of travel service for entertainment or other needs. Credit cards are accepted. For more information or to book a tour call (805) 423-6838 or (805) 286-6341. Visit pasorobleslimotours.com for online information or online booking. Press release by Access Publishing, a Paso Robles advertising agency, 806 9th St. #2D, Paso Robles, CA 93446.